543 pages | 32 Color Illus. | 73 B/W Illus. 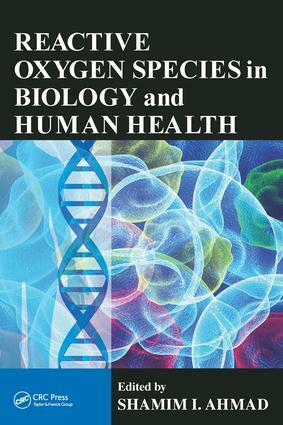 Unlike other narrowly focused books, Reactive Oxygen Species in Biology and Human Health provides a comprehensive overview of ROS. It covers the current status of research and provides pointers to future research goals. Additionally, it authoritatively reviews the impact of reactive oxygen species with respect to various human diseases and discusses antioxidants and other compounds that counteract oxidative stress. Comprised of seven sections, the first section describes the introduction, detection, and production of ROS, emphasizing phenolic compounds and vitamin E for their abilities to act as antioxidants. This section also highlights the role of lipoprotein-associated oxidative stress. Section two addresses the importance of iron accumulation in the brain resulting in the development of a group of neurodegenerative disorders (NDs) and identifies several causative genes for neurodegeneration with brain iron accumulation (NBIA) associated with Parkinsonism-related disorders. The third section discusses a number of NDs, including amyotrophic lateral sclerosis (ALS), Alzheimer’s disease (AD), Huntington's disease (HD), epilepsy, and multiple sclerosis (MS). Section four addresses autoimmune diseases caused by ROS, including asthma, autoimmune liver diseases, rheumatoid arthritis, thyroid disease, primary biliary cirrhosis, and systemic lupus. Section five analyzes a number of different cancers, including lung cancer, breast cancer, and melanoma, along with possible treatment regimens. Section six discusses cardiovascular diseases (CVDs) induced by ROS, presents the ROS-associated complex biochemical processes inducing inflammation as an important cause of CVDs, and explains the roles carotenoids play in preventing CVDs. The final section addresses other human diseases induced by oxidative stress, including sickle cell disease, nonalcoholic steatohepatitis, retinopathy, fibromyalgia, chronic obstructive pulmonary disease, asthma, pulmonary hypertension, infertility, and aging of human skin. Shamim I. Ahmad, after earning his master’s degree in botany from Patna University, Bihar, India, and his PhD in molecular genetics from the University of Leicester, England, joined Nottingham Polytechnic as a grade 1 lecturer and was subsequently promoted to the senior lecturer post. Nottingham Polytechnic subsequently became Nottingham Trent University, where, after serving for about 35 years, he took early retirement, yet continued serving as a part-time senior lecturer. Dr. Ahmad is now spending much of his time producing/writing medical books. His present interests include DNA damage and repair, specifically by near-ultraviolet light.